The first photo below is an interesting postcard photograph of the Groes in Nefyn one hundred years ago, just before the onset of World War I. High Street is on the left, St David’s Road going up the Penybryn hill towards Morfa Nefyn is on the right and the top of Well Street is just visible on the extreme right. The long building on the corner between High Street and the hill is where the post office was first established in Nefyn in the late 1870’s. In stark contrast to today, there are many windows on the gable end of that building overlooking the lower part of the hill. The building also has five windows on the upper floor overlooking High Street. The photo captures the old Cross Keys house just coming into view on the extreme right between the hill and Well Street. It has the old oil street lamp mounted on the corner. From this postcard photo and others, I have sequenced the events that shaped this corner of the Groes in Nefyn over the past one hundred years. Y Groes, Nefyn early 1910's. When the photo was taken there were two businesses occupying the corner building, the London City and Midland Bank and the Jones Shop. The Bank occupied the portion of the building on the right with steps leading up to its entrance on the angled corner and with two picturesque, twenty-pane windows on each side. This was the portion occupied earlier by the old post office. The Jones Shop was further along High Street with an entrance in the part of the shop that extended out on to the pavement. The London City and Midland Bank originated as the Birmingham and Midlands Bank in Birmingham, England in 1836. It merged with the Central Bank of London in 1891 then becoming the London City and Midlands Bank. In 1908, the bank acquired the North and South Wales Bank giving it a strong business presence in Wales. It was shortly after this period that the bank branch opened in Nefyn. In 1923, the bank became the Midlands Bank Ltd, one of the largest banks in the world. The branch in Nefyn eventually moved across the Groes into a larger building. The Jones Shop was a Nefyn-based business serving as newsagents and tobacconists. The shop was also an ironmongers selling a range of general goods. In the photo the advert on the shop front, below the Jones name, was for sewing machines. When the bank branch moved across the Groes, the Jones Shop occupied the remainder of the building. The shop was always referred to as the Old Post Office or as Shop Old Post. The photo shows a man with a ladder washing, or doing some painting work, on the upper-floor windows on the gable end of the bank. There are a total of six windows on the gable end including one of those twenty-pane windows just behind the horse The window the man is apparently working on seems to require both a lot of cleaning and painting. He has another ladder on the ground near where three children are standing to have their picture taken. 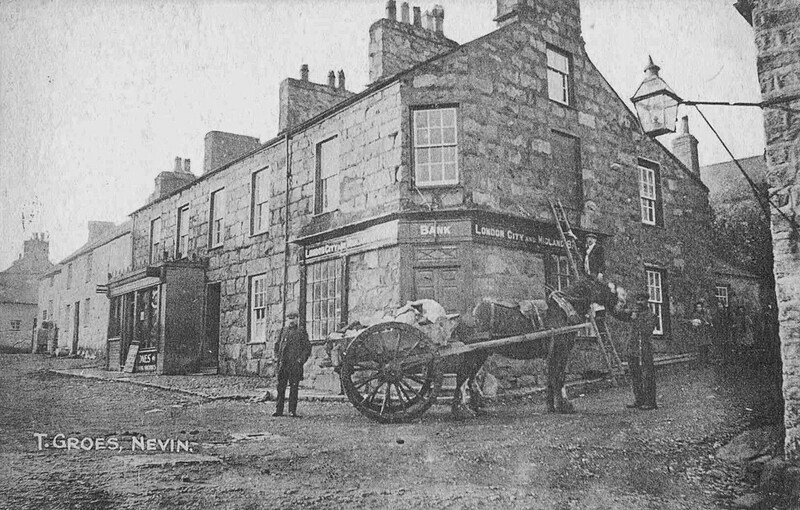 I am not sure if the horse and cart hauler is working with the man on the ladder or whether he has just momentarily stopped the horse and cart to have his photo taken - likewise for the individual standing behind the cart. The postcard photo has no publisher name or number. The photo was likely taken by Fred May of Pwllheli who was a high quality photographer and who encouraged local people to participate in his photos. The roof of Capel Soar is visible on the upper right and other old buildings along High Street are shown further on the left. In the late 1920’s or early 1930’s, with traffic building up on the Nefyn to Morfa Road, major renovations had to be made at the corner of the Groes. St David’s Road was just too narrow at the bottom of the hill. It was essentially one lane, as shown in the photo, with hardly any room for people to walk on either side of the street. The road had to be widened to accommodate both passing cars and pedestrians. A similar problem existed further up High Street but more on that in the next paragraph. The widening was achieved by removing nearly the complete portion of the building occupied by the bank in the photo. Even though this was a very sad outcome, unfortunately there was no alternative. I am not certain when the removal took place - maybe it was the catalyst that forced the bank branch to move across the Groes. After it was finished, the building was left with no windows at all on the gable end and with only four windows on the upper floor overlooking High Street. And that remains the basic format of Shop Old Post to this very day. The other spot where traffic was essentially single lane on High Street is shown in the second photo. The one house facing the Groes was protruding out on to the street and it had to be completely demolished. Like Cross Keys, that house also had a majestic oil street lamp on its corner. There were several more oil street lamps around Nefyn at the time. There was another one on High Street at the corner with Y Maes and another two along Palace Street - one at the junction with Church Street and one at the junction with Y Maes. Those lamps are shown in other photos on the website. There were lamps also on the corner of the Madryn Hall and at the bottom of Well Street. The oil lamps were lit by a lamp lighter at dusk and extinguished late in the evening or early the following morning. 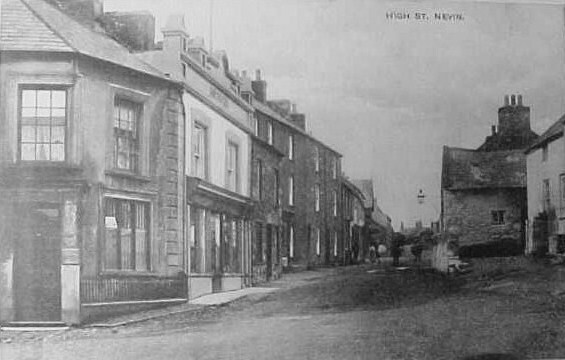 High Street, Nefyn early 1910's. These were the days before electricity was available as a commodity in Nefyn. People were using candles and tallow or oil lamps in their homes for lighting. Electricity was first delivered to the Carreg y Llam Quarry to operate their granite crushers in late 1927 and then forwarded on to Nefyn in 1928. When homeowners could afford it, there followed a rapid distribution of electricity throughout the town. Incandescent bulbs replaced the oil lamps on the streets and replaced the candles and lamps in the houses. The new lighting was more effective and more reliable. It was welcomed with great excitement in the town especially during the long and dark winter evenings. The third photo shows the High Street in the late 1920’s. The building demolished earlier was replaced by Shop Glynllifon - today it is a Spar Store. The building next to Shop Old Post was replaced by a Barclays Bank building - today it’s a restaurant and wine bar called the Folt. In the late 1940’s, the old Cross Keys house was pulled down to further improve traffic visibility on that corner of the Groes - today it is a convenient gathering place with a sitting area for the townspeople. Minor changes were made to modernize Shop Old Post including plastering over the exposed stone. Unfortunately the plastered-over gable end became the main canvas for undesirable graffiti in the town. The Midland Bank across the Groes was taken over by HSBC Bank and after one hundred years of history in Nefyn it was closed in 2012. 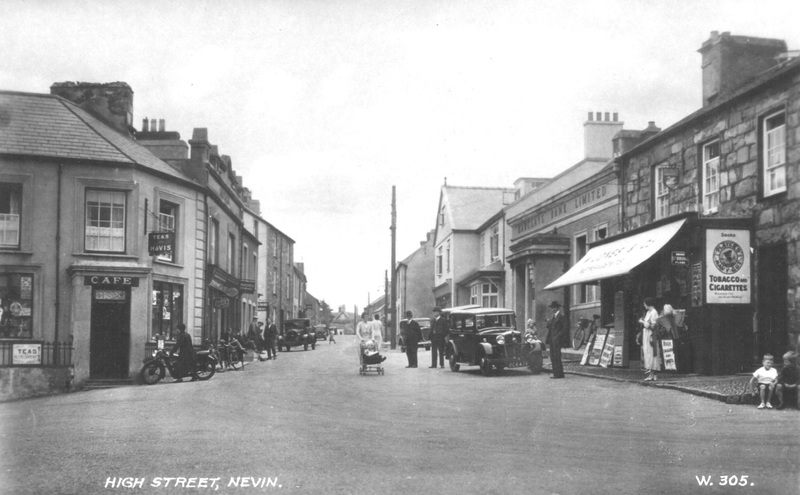 High Street, Nefyn late 1920's. Take another look at that first photo. It is really a good photo of Nefyn in the old days. Yes, it’s a little drab and grey during daylight hours but it takes little to imagine a beautiful Christmas scene on a snowy evening on that corner of the Groes one hundred years ago. There were candles in all the shop and bank windows and a small group from the Church were singing carols on High Street. The lamp lighter had just turned on the oil lamp on the corner of Cross Keys and the flickering light from the street lamp was reflecting off the twenty-pane window across the street on the gable end of Shop Old Post.